Dr Ana Wilson is a luminal gastroenterologist and specialist gastrointestinal endoscopist. Her specialist interests include early diagnosis, prevention and treatment of pre-cancerous lesions and cancer, through colonoscopy, in patients with inflammatory bowel disease and those at increased risk of developing colorectal cancer. Dr Wilson specialises in advanced endoscopic imaging and complex therapeutic endoscopy including endoscopic mucosal resection, stricture dilation, stent insertion, treatment of bleeding lesions and duodenal polypectomy with access to a regular general anaesthetic list. She also manages all aspects of gastrointestinal disorders and provides care to the acute gastroenetrology patients at St Mark’s and Northwick Park Hospitals. Dr Wilson qualified from University of Oxford in 2002. She obtained Membership of the Royal College of Physicians in 2005 and trained in gastroenterology and general internal medicine in Oxford Deanery. 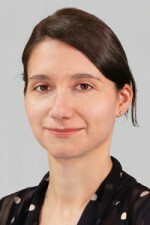 She spent three years at the Wolfson Unit for Endoscopy, St Mark’s Hospital undertaking research in the use of colonoscopy in diagnosis and assessment of dysplasia under the supervision of Prof Brian Saunders that led to an MD thesis at the Imperial College, London, and has published widely on the subject. After completing her training, Dr Wilson specialised further in management of complex inflammatory bowel disease and endoscopy at University College Hospital, London. She was appointed as Consultant Gastroenterologist and Specialist Endoscopist at St Mark’s Hospital in December 2012. She has been an invited speaker at numerous national and international meetings and has contributed to a number of guidelines on the use of advanced imaging in lesion recognition including in inflammatory bowel disease.